I hate to admit it, but I can be a bit of a Valentine’s Day grinch. I have nothing against love, chocolate (or any candy for that matter), or cards, but I just don’t feel the need to go all out for Valentine’s day every year. I didn’t actually have a valentine until the first year I dated my now husband, when I was just 19 years old. As the big day approached, I was excited. I had waited 19 years to actually have a boyfriend over the holiday that celebrates being in a relationship. When the day finally arrived, we exchanged gifts, ate a delicious meal, and although I had fun, I thought what is the big deal? We can do this anytime. So, sorry Valentine’s day lovers, it’s just not for me. Every year my husband and I make sure we spend time together and make an extra delicious dinner at home. But we opt to save our babysitting and eating out money for a day that doesn’t include cost premiums. This year for Valentines day I will give my hub an extra hug and I will also be celebrating by participating in the Teachers Pay Teachers site wide sale. Everything in my store will be 25% off. If you like any of my bundle packs, that can equal a decent amount of savings. This is on oldie, but a goodie. It has held top spot for sales, traffic, and wishlists for some time now. This was my very first bundled item, and I am so happy other art teachers love it as much as I do. It is a staple in my high school Intro to Art course. 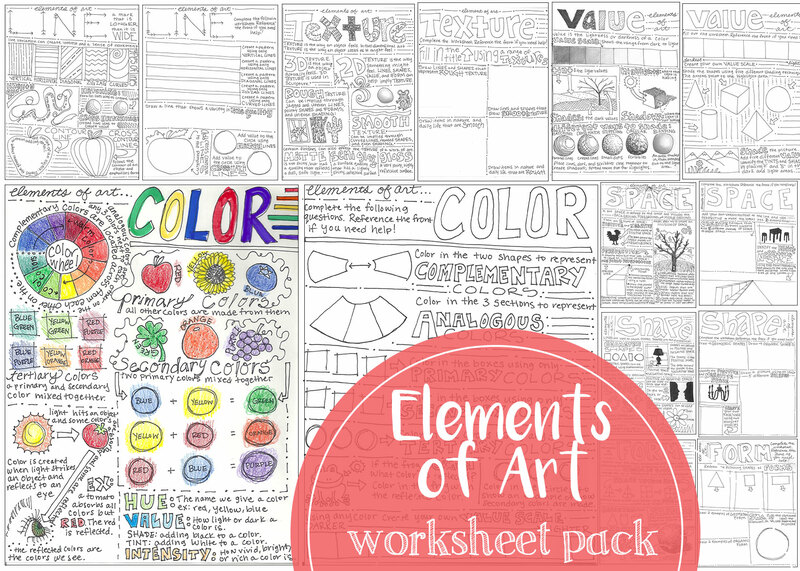 The bundle pack includes seven back and front worksheets that cover the elements of art. Each worksheet has visual examples and information about the elements: color, line, value, form, shape, texture, and space. The back of the worksheets have activities to complete to show their understanding of what was covered on the front. 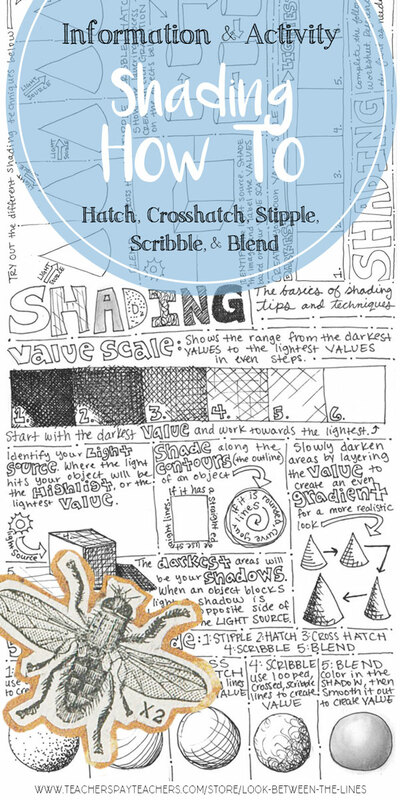 This worksheet pack is great to have on hand for substitute days, early finishers, or to test your students’ understanding of the elements of art. This bundle is listed for $10.00, you save $4.00 by purchasing the bundle rather than the worksheets individually. You can purchase it for just $7.50 on 2/14/18 and 2/15/18. Check out this product here. 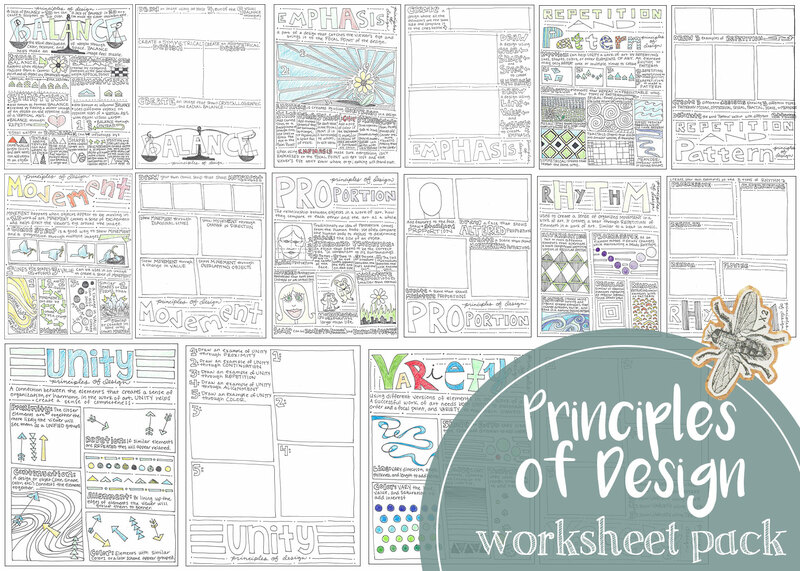 With my elements of art worksheet pack as #1, it’s no surprise that my hand drawn principles of design worksheet pack is my second most wish listed item. 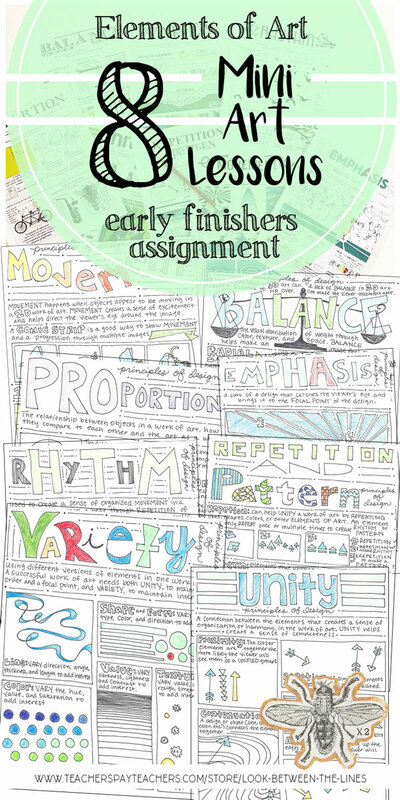 I began working on this worksheet set as soon as I completed my elements of art pack. 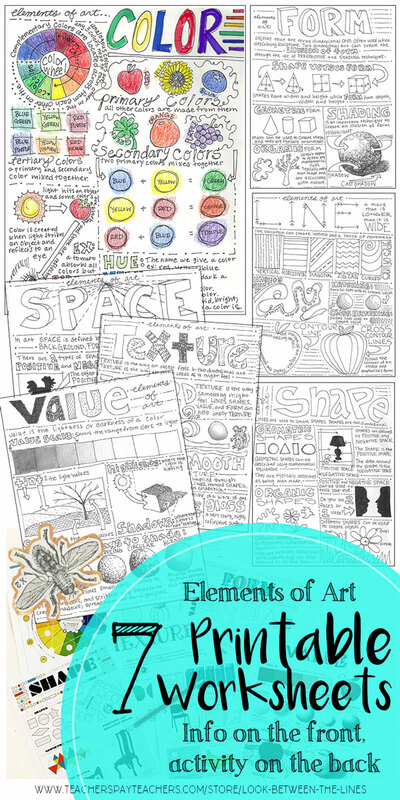 Like the elements of art worksheets, this has visual examples and information on the front and an activity on the back. I also use these in my Introduction to Art course. They are great for late elementary schoolers, middle school, and high school art students. There are eight back and front worksheets in total. Check out the pack here. This bundle is listed for $10.00, you save $6.00 by purchasing the bundle rather than the worksheets individually. You can purchase it fur just $7.50 on 2/14/18 and 2/15/18. Check out this product here. My third most wish listed item is also my most expensive. It’s my year long Introduction to Art curriculum. It’s priced at $100.00 for the pack, but you save $86.00 by purchasing the bundle rather than the lessons individually. This is a great product to purchase during sale days because it costs more than my average item. It will be marked down to just $75.00 on 2/14 and 2/15. 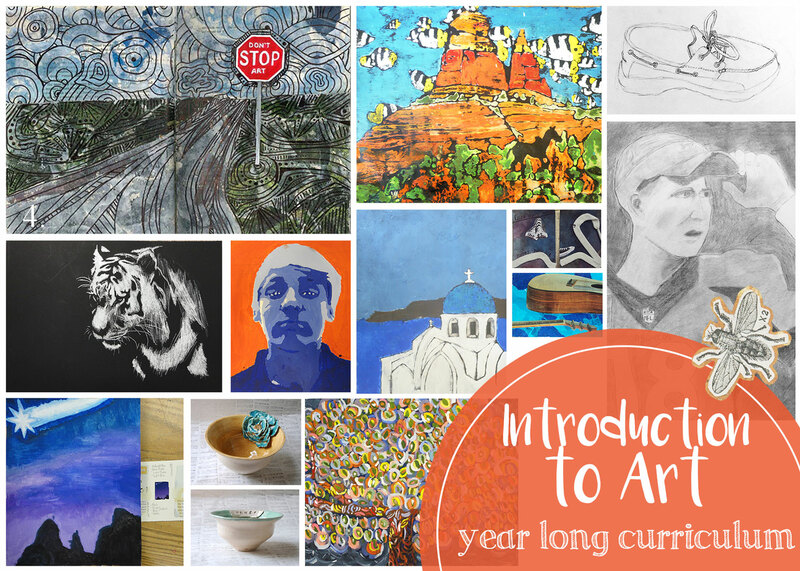 You won’t need to plan a single day for an entire year in your Intro to Art course. There is also a timeline included if your class is only a semester long. All in all this file includes: yearlong timeline, semester long timeline, first day items (syllabus bathroom passes, tell me about you sheet, art survey, letter to parents, artist to know table, and behavior contract), art notebook set up (table of contents and worksheets), 20 lesson plans (includes big idea, essential questions, goals, objectives, supplies, vocabulary, step-by-step instructions, national standards), 17 rubrics, 6 critique worksheets, 16 PowerPoints, 42 worksheets (includes elements of art, principles of design, visual journal, drawing, color theory, perspective, contour line, and many more). 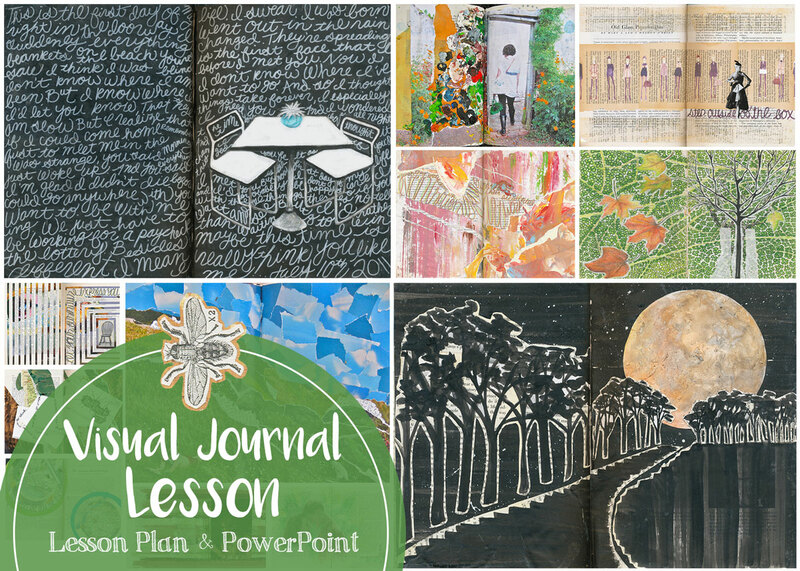 My #4 wish listed item is my visual journal lesson plan and PowerPoint pack. 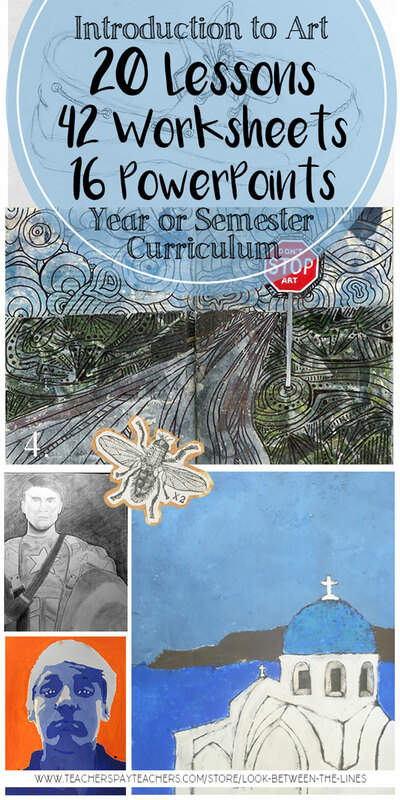 This is what I use to introduce visual journals to my students every year. This is a project I do in every single class, and it lasts the entire semester or year depending on the length of the course. It’s always one of my students’ favorite assignments because they have so much freedom in the assignment. They get to choose the materials and topics, they just have to have a certain number of pages complete by the end of the course. 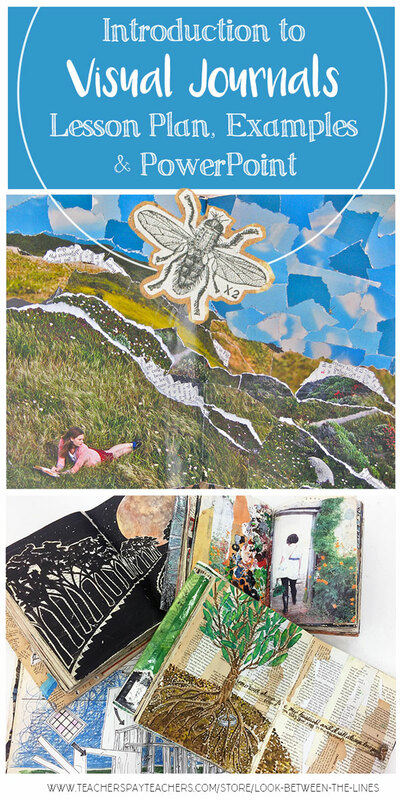 I obviously have a passion for visual journaling, it’s the entire reason I started this blog. I love sharing my inspiration and methods; it’s no different in my classroom. I encourage every art teacher to give this project a try. I love seeing my students take it and run with it. Also check out my visual journal bundle pack, which includes all of my visual journal how to handouts as well. My #5 most wish listed item is also one of my cheapest, my general shading handout for just $2.00. I use this handout in both my Introduction to Art class and my Drawing class. 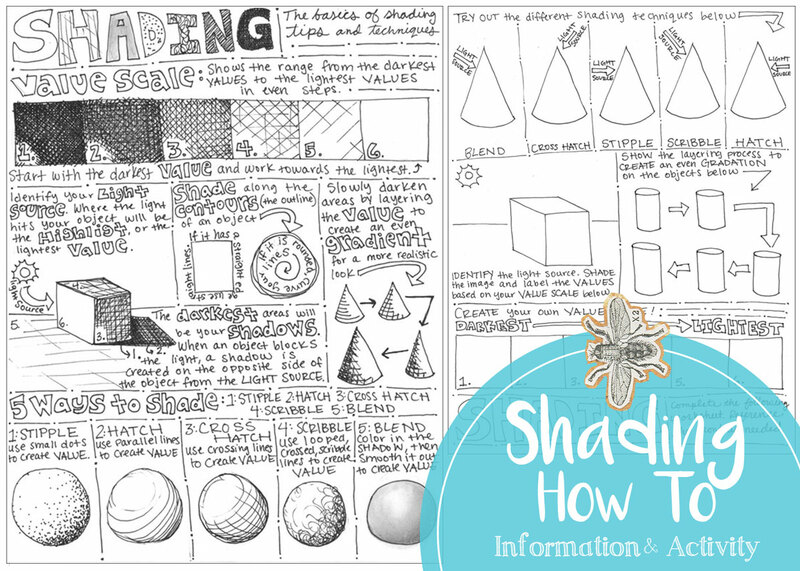 It’s a great refresher or introduction to basic shading techniques. It covers shading using hatching, crosshatching, stippling, scribbling, and blending techniques. The front shows examples and the back is full of activities for the students to complete that tests their knowledge of the information covered on the front. Don’t miss the Valentine’s Day sale, this will be the last one until the end of the school year. There are so many amazing products available on TPT to help make our lives easier and further enrich our students, I hope you give the website a try if you haven’t yet. Thanks taking for taking the time to check out my blog! Help spread the word by sharing with others. Thanks for stopping by!